Iron (Fe)-doped indium tin oxide thin films (In0.95 − xFexSn0.05)2O3 at x = 0.00, 0.05, 0.10, and 0.15 were deposited onto glass substrates using an electron beam evaporation technique. The coated thin films were characterized by X-ray diffractometer (XRD), UV-VIS-NIR spectrophotometer, photoluminescence spectrophotometer, scanning electron microscope, and vibrating sample magnetometer to study their structural, optical, morphological, and magnetic properties, respectively. The crystallite size of the films increased from 18 to 30 nm with Fe concentration (x). The morphology showed the formation of nanorods. The bandgap of the films decreased from 3.94 to 3.81 eV. The X-ray photoelectron spectroscopy (XPS) studies confirm the presence of Fe ions in two different oxidation states (Fe2+, Fe3+). The magnetic studies revealed the paramagnetic behavior of the films at room temperature and at low temperature (5 K). 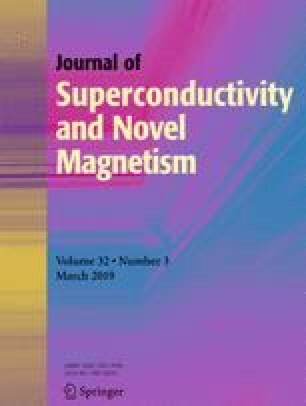 The effective magnetic moment (μeff) of Fe-doped indium tin oxide thin films was calculated using Langevin theory of paramagnetism extending to Curie’s law. The effective magnetic moment (μeff) was increased on increasing the dopant concentration. The authors are grateful to UGC-DAE-CSR, IGCAR, Kalpakkam, 603102, Tamil Nadu, India, for providing financial support under Project Sanction number (CSR-KN/CRS-72/2015-2016/809) to carry out the present work. The authors are very thankful to VIT-SIF for providing XRD and DRS facilities to carry out the present work. The authors are grateful to National Physical Laboratory (NPL, New Delhi) for providing the PL spectrophotometer. The authors are also thankful to UGC-DAE-CSR, IGCAR, for providing VSM facility.